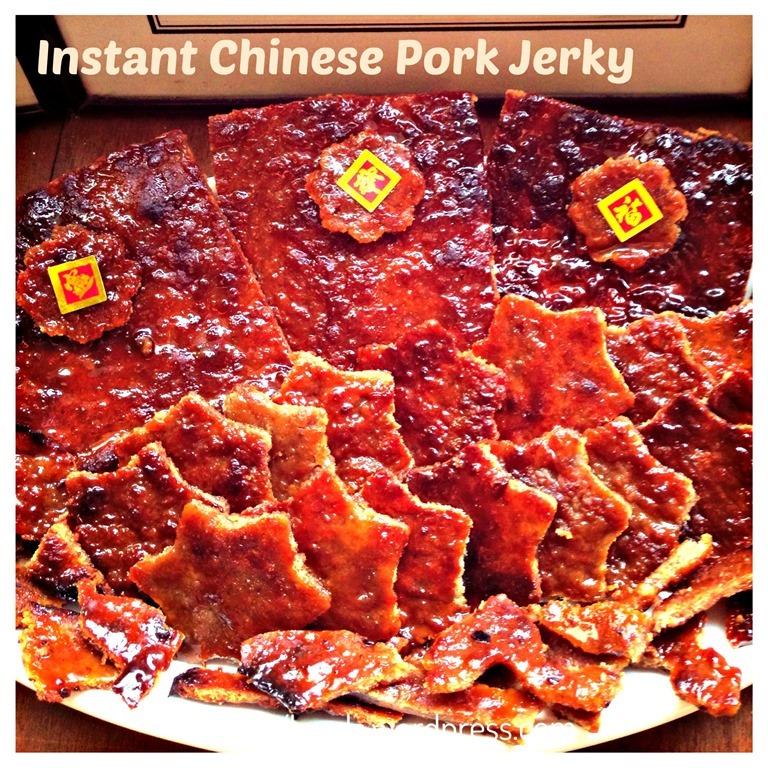 I am busy baking my cookies and in between my oven slots, I have prepared some Chinese pork jerky or “Bak Kwa”. As long as I can remember, we always have Bak Kwa during Chinese New Year. When I was a kid, it is once in a year delicacy served during Chinese New Year. 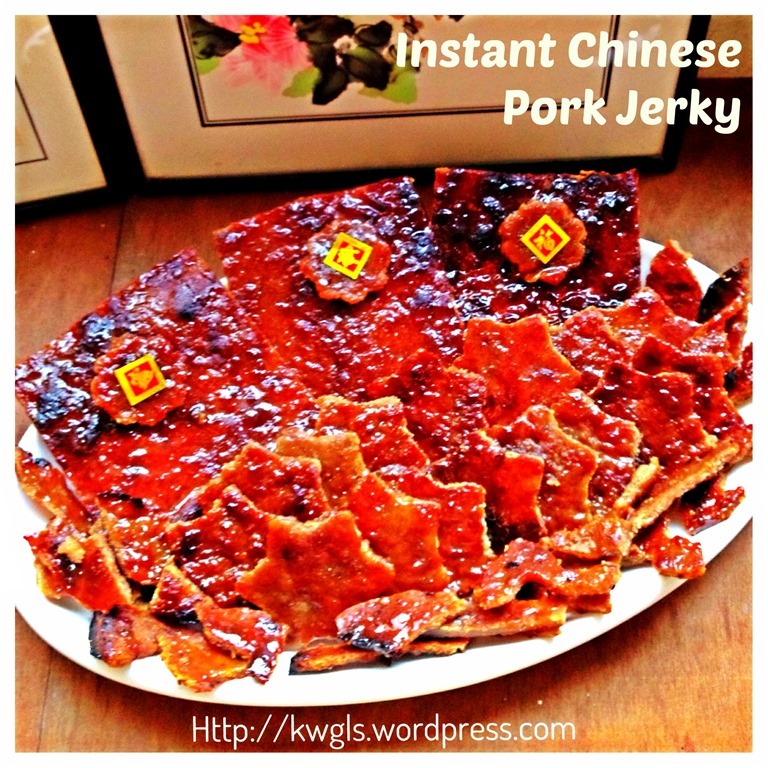 Then, most Bak Kwa were imported from China and were mostly air dried. It is hard, chewy and difficult to bite. As years went by, there are more and more varieties and what is the most common type of Bak Kwa nowadays is the sweetened and soft type of Bak Kwa mostly made from minced pork. 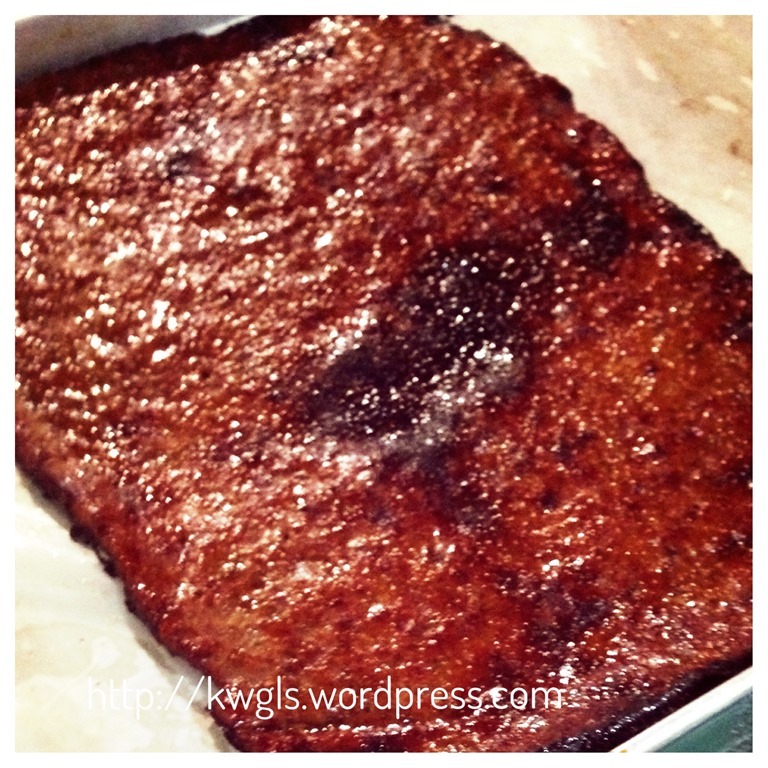 I loved Bak Kwa for its sweet and soft texture. 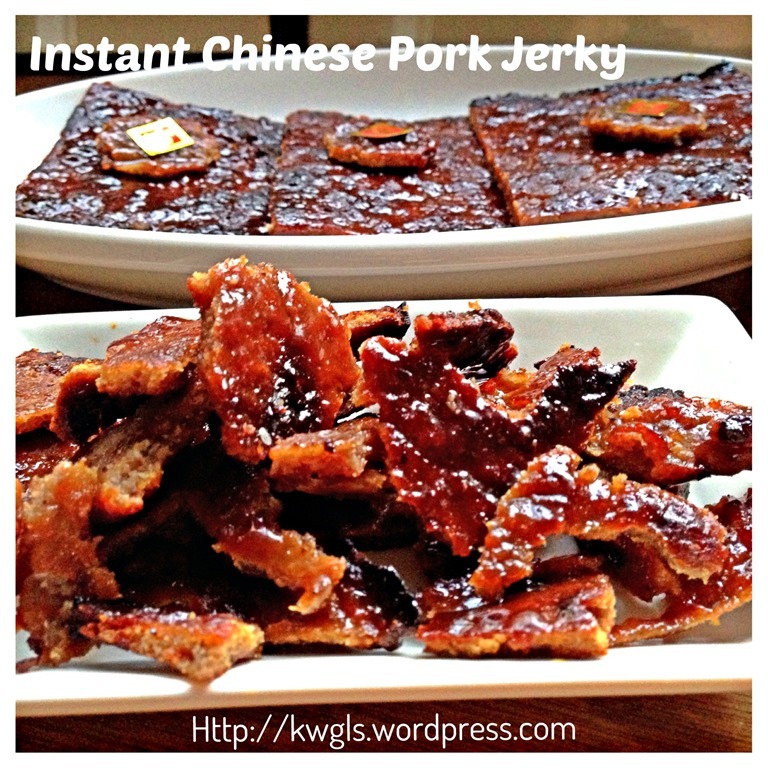 It is essentially barbecue sliced or minced pork. In Singapore, one kilogram of Bak Kwa during Chinese New Year can fetch as high as SGD40-50. It is quite costly but presentable gift to relatives and friends. Since I am lazy and I knew Wikipedia will have a detailed write up on Bak Kwa, therefore, for the sake of my international readers, I have reproduced it here for information. Preparing Bak Kwa has been in my to do list for quite a while. 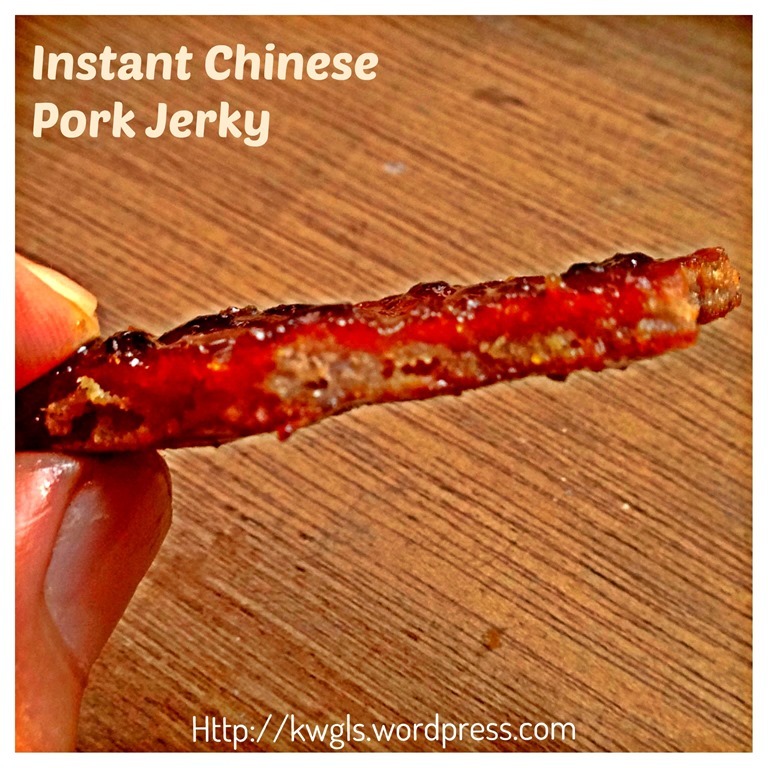 It came across my mind after I issued my Chinese Barbecue Pork in October 2013. I did not take a step to prepare it as most recipe will call for long hours (or at least overnight) of marinating, some even called for air drying or sun drying before the grilling. 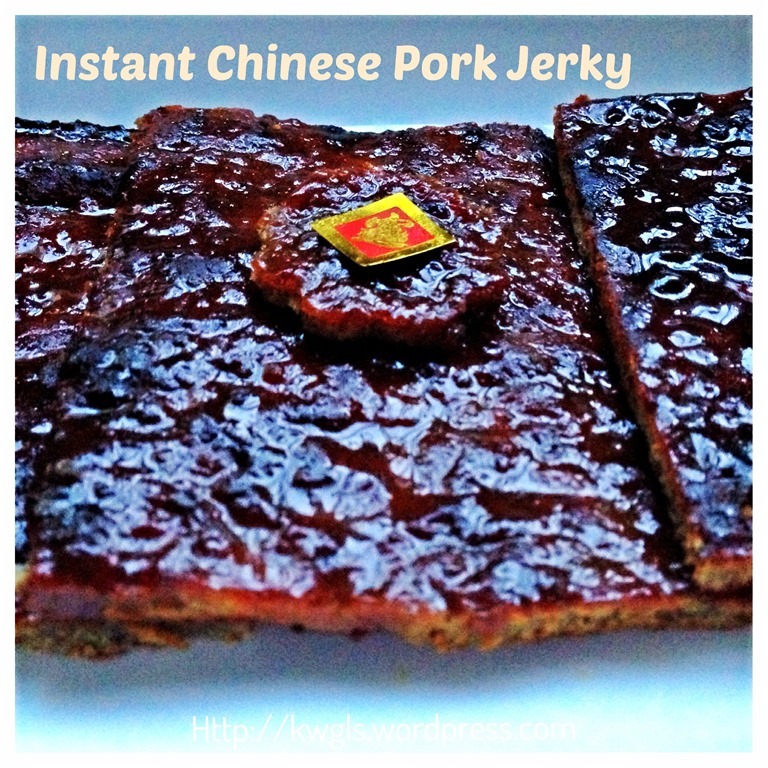 I knew I did not have the patience and with an oven slot available 2 days ago, I have experimented to see if there is an easy way to prepare this delicious pork jerky. Frankly, I did not follow any recipe. 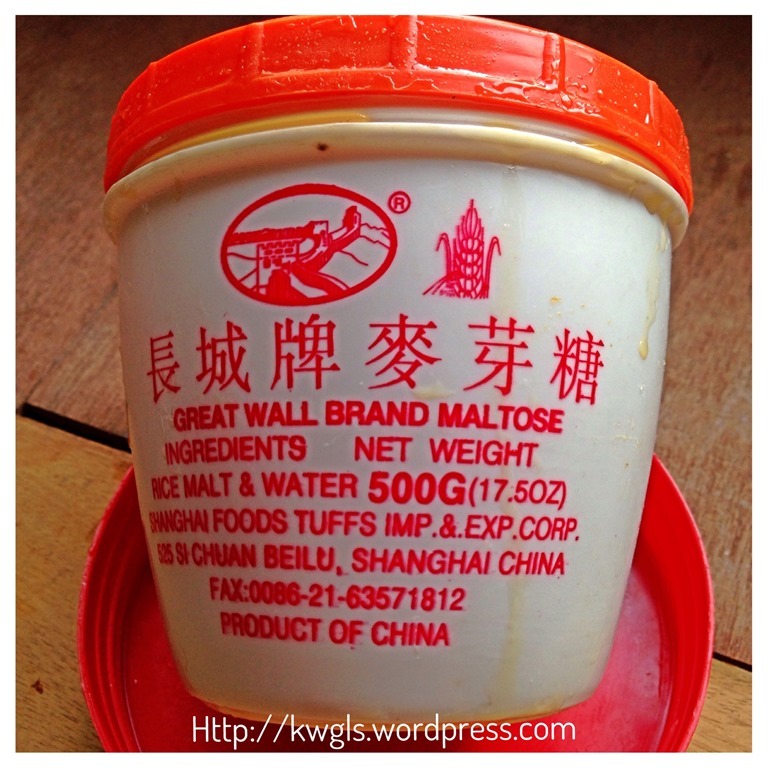 I browsed through a few recipes in Mandarin and looking at the marinating agent. 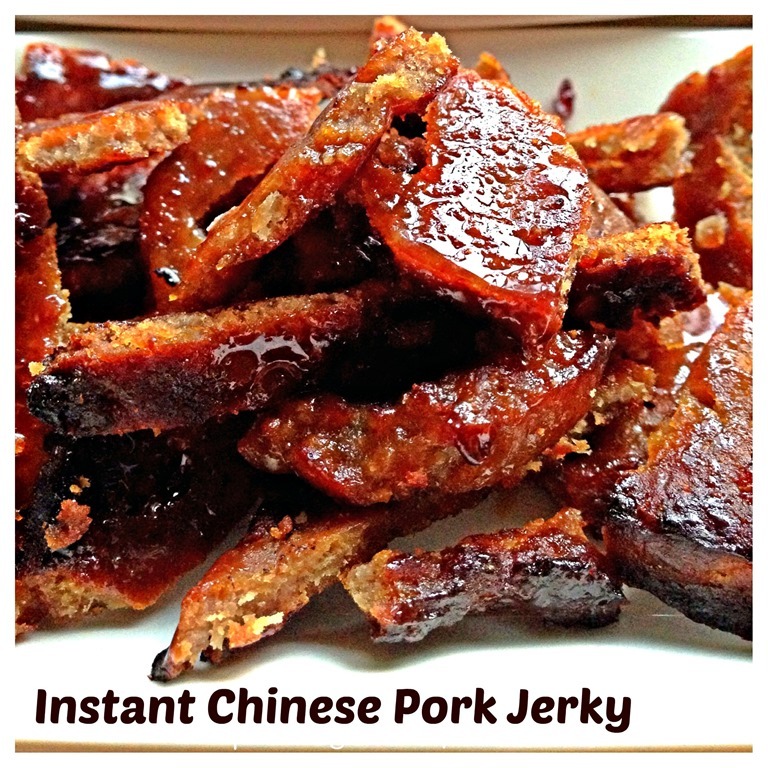 Apparently, each recipe have its own marinating agent and therefore I have decided to use my Chinese barbecue pork marinating agent plus a new ingredient (maltose) to prepare the pork jerky. Since this is an experiment (that turns out to be very satisfactory), I just add the marinating agents to my minced meat, use a food processor to mince it again, and test grilled a small portion of the minced pork in the toaster oven (mini oven). I found that the result were satisfactory and I continue to grill all the minced meat in my oven. I started the preparation at 5:00 pm and I have my Bak Kwa ready at 7:00 pm. I am pleased with the results. 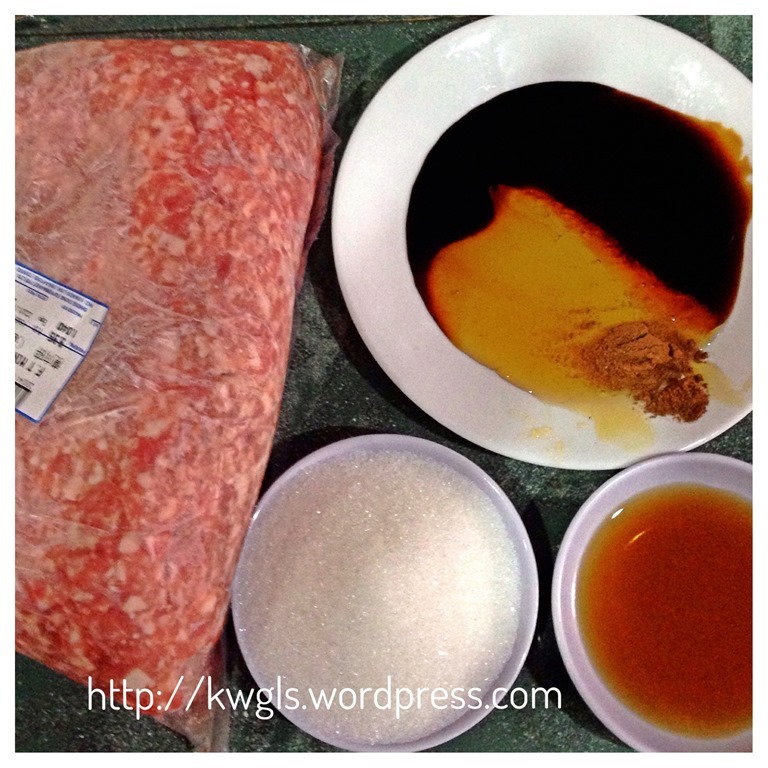 My trial was based on my beliefs that since it is “double minced pork”, all the spices and marinating agents can penetrate the pork very easily. Instant grilling will definitely take longer timing since it is wetter. As long as we can force the water out of the meat – it will become a piece of meat with spices and seasonings that we like. Therefore, the temperature and timing of grilling will be rather different. Since I can prepare Bak Kwa within 2 hours, it means that I can have Bak Kwa as one of the household dishes to go with rice or porridges at any time I want. 2 tablespoons of red fermented bean curd (红腐乳) juice (not in picture) please refer Chinese Barbecue Pork for pictures. Note that this recipe is very flexible. It is advisable to test grill or test pan fried a small portion of the minced meat before you start grilling the whole batch. Feel free to adjust the quantities and suggested ingredients to suit your taste buds. 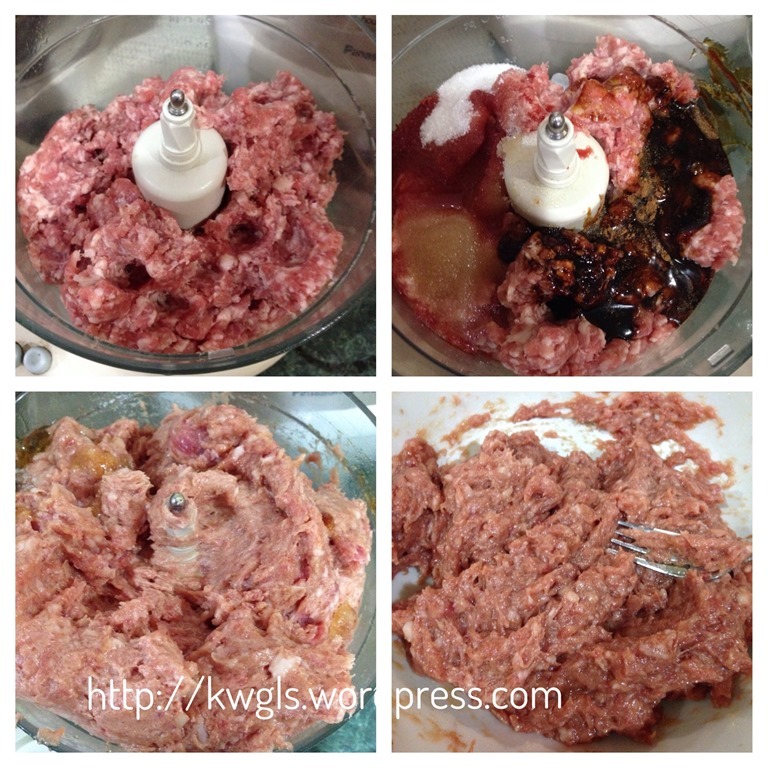 Put the minced meat and all the ingredients into the food processor. Minced until fine. 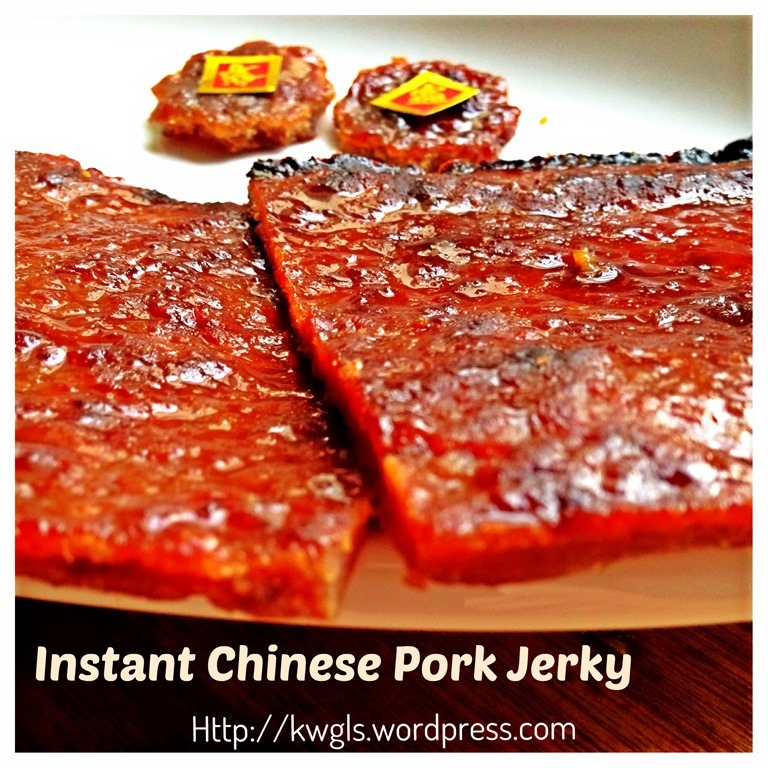 As I like my Bak Kwa to be a bit chewy, therefore, I did not minced until very fine. Ensure that all the seasonings are well combined. Remember to test bake a small portion before you follow the following steps. Add additional seasonings if preferred. Divide the minced meat into 2 portions for the 2 baking trays. Put a piece of clingy wrap and use a rolling pin to spread as evenly as possible and the thickness should be about 0.5 cm. Bake in the oven for about 10-12 minutes. 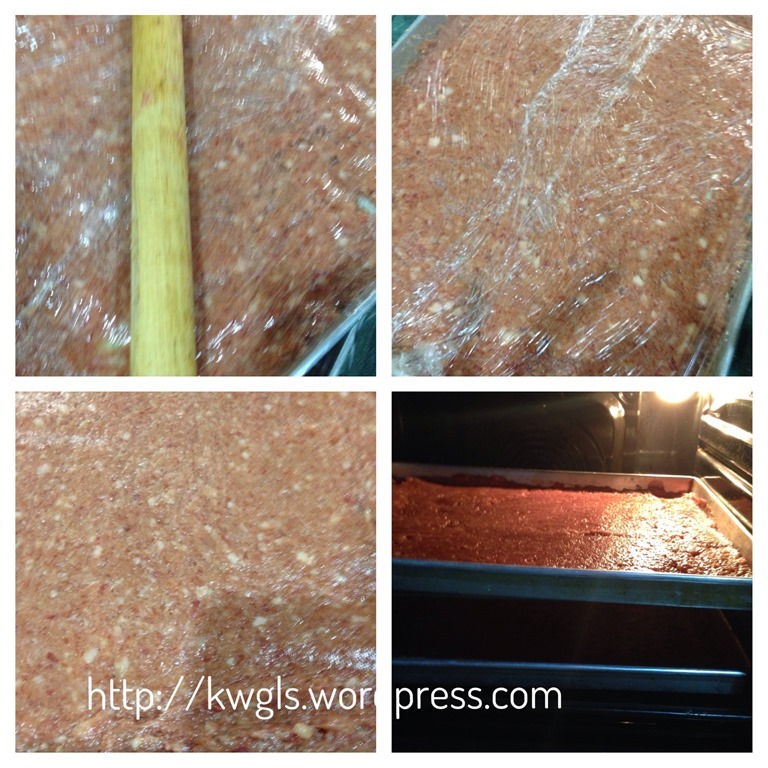 During this process, you will start to witness the minced meats start to shrink and water starts to secret out. As long as the meat transform into a big piece of meat without breaking, proceed to the next step. Take out the baking tray out and throw away the baking paper. Transfer the semi grilled pork out and put it in plate. Meanwhile, put a cooling rack in the baking tray. Put the meat on the cooling rack (with baking tray). Brush the meat with the additional maltose (2 tablespoons of maltose or honey with 2 tablespoons of water. If too sticky, add another tablespoon of water. ) evenly. Send back to the oven. Turn on the top grilled heat at 180 degree Celsius. Grilled for about 5 minutes or until it reach the desired colour tone and dries up. Take out the baking tray, turn the Bak Kwa, brush and baked again for another 5 minutes or until it reach the desired colour tone and dries up. Immediate after you take out from the oven, it will be rather dry and slightly crispy because of the maltose effect, if you rest it for second day in the room temperature, it will be softer. 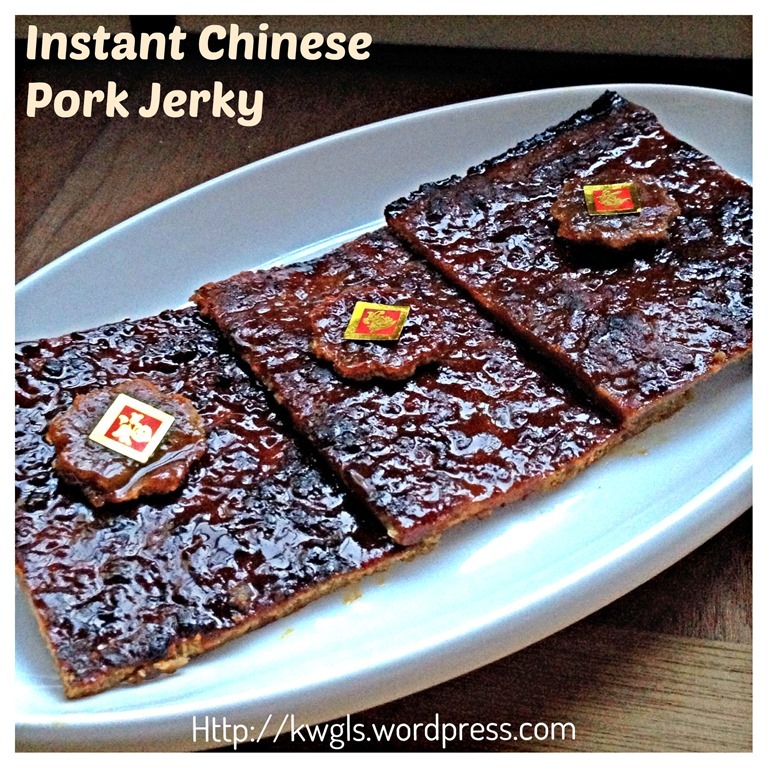 A simple fast (almost instant) recipe of Bak Kwa for you try out. It is full of flexibilities. Let me know if this is what you like. Remember to test grill a small piece prior to grilling the entire kilogram of minced meats. This recipe was included in Page 54 and Page 55 of the following E-book. 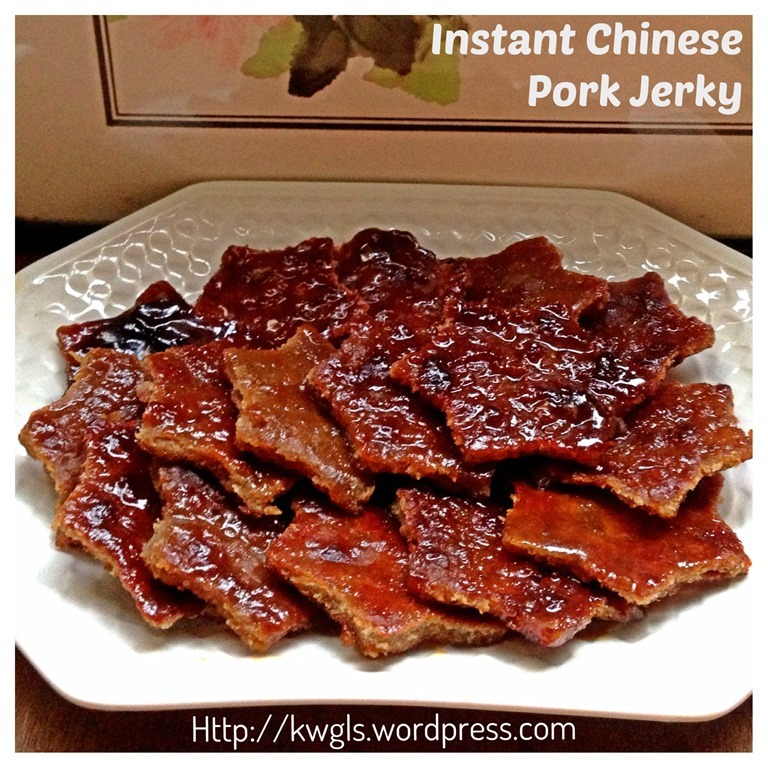 This entry was posted in Chinese New Year 2014, Dish, Food Preparation Series, Meat Dishes and tagged 8, Chinese New Year 2014, Chinese Pork Jerky, GUAI SHU SHU, Guaishushu, Instant Bak Kwa, kenneth goh, postady. Bookmark the permalink. Very cool idea! Instant is always nice! Thanks for posting on the Four Seasons Blog Hop! Sandra from Scrumptilicious 4 You! Yet another fascinating recipe Kenneth! 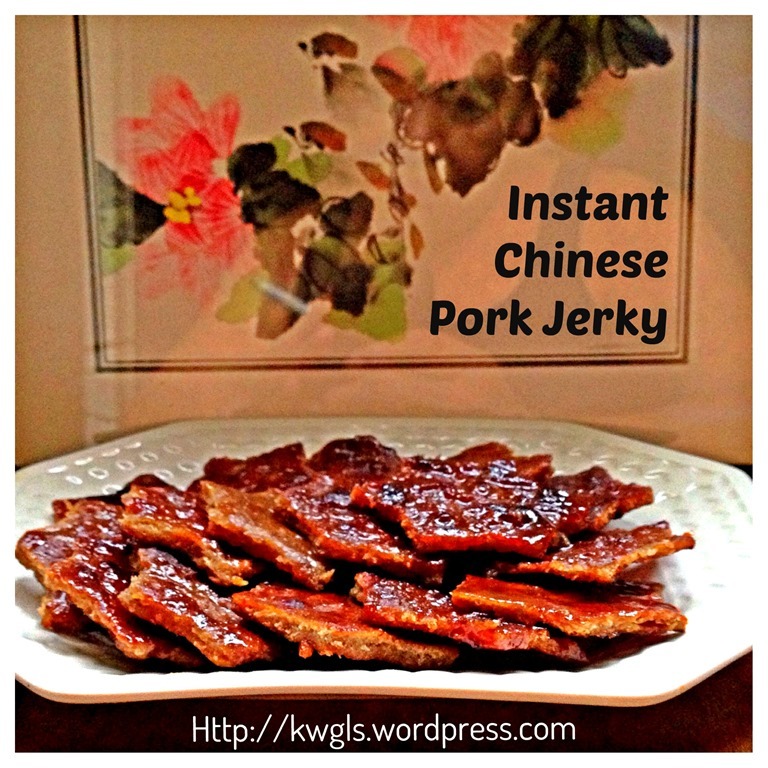 I too have no patience so I have never bothered to attempt Bak Kwa myself. But now thanks to your recipe I must give it a go. Interesting! 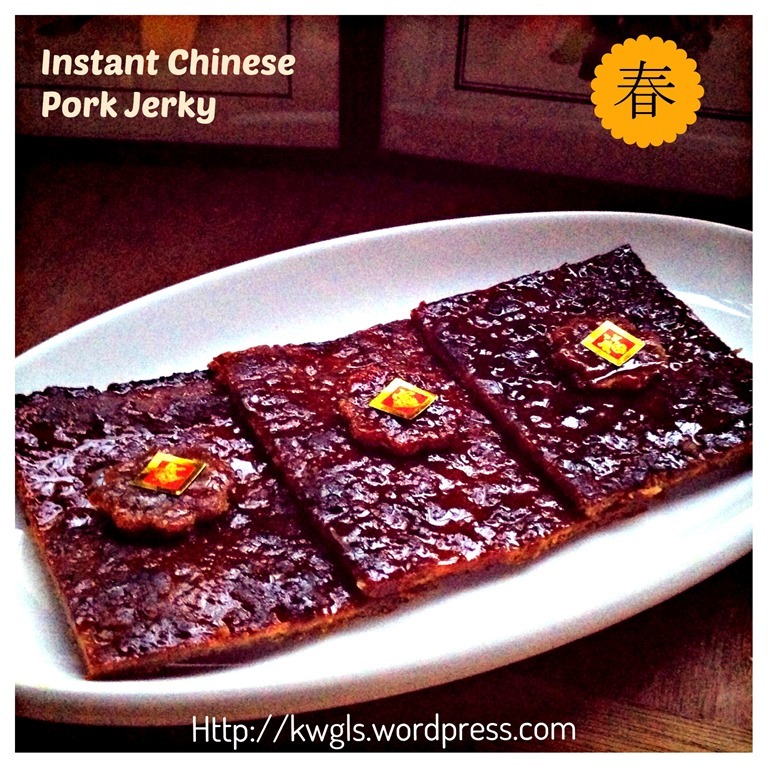 Instant bak kwa is born into our world. I am kind of ‘new hand’ in baking and cooking. I’m enjoying a lot in reading your blog. I have some questions would like to ask from you. Whenever the recipe called for bake, is it mean bake function on the oven? Or convection? What is the difference between these 2 functions? And sometimes there is turn off/on the fans? Where’s the fans come from? Or it is another function that could be found on certain brand of oven? Appreciate your advise and thanks a lot for your time! I’m attempting the bak kwa recipe as I’m typing this. I found the meat doesn’t have the nice glossy color, even after brushing with maltose/water syrup. And when I tried to flip over, it breaks at times. 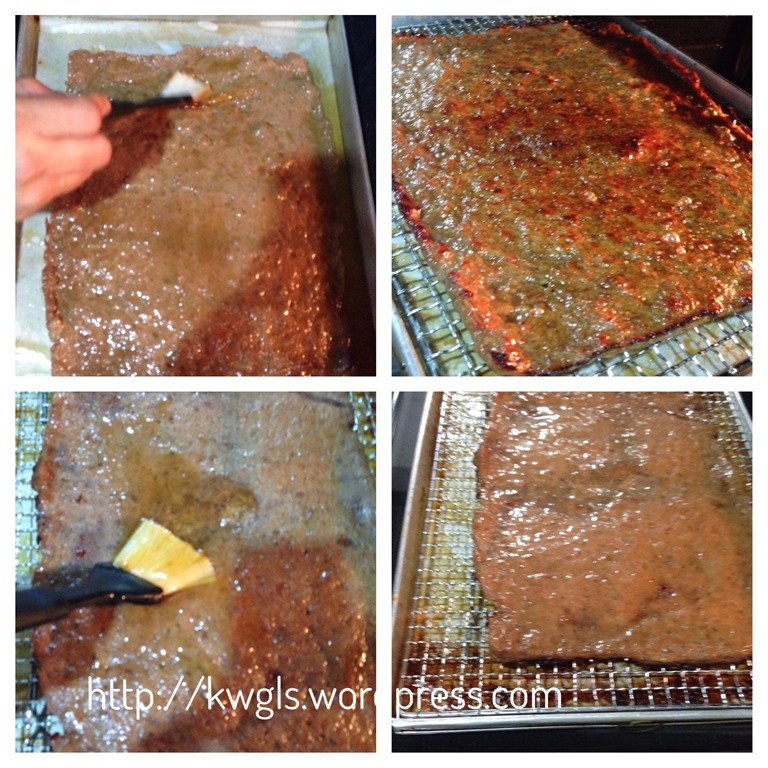 How did you achieve the coloring of your bak kwa? I have prefer a few times and this never occur to me. The meat breaks possibly because your meat is not lean and fine enough and when fats melt, it start to form holes and destroy the structure. As for the colouring, every oven is different. If your oven can’t achieve the colour tone you want. In the last 5 minutes or so. turn on top grill just to grill for colour purposes. It must put in the top rack but you must keep a close eye on this process to prevent overly burnt.